Scott is a Healer, Writer, Teacher, and Witch-Priest. Scott's work combines the esoteric + magickal arts of various studies in mystery traditions, a large body of private and public work ranging from healing, ritual, art, speaking and crafting, for liberation. 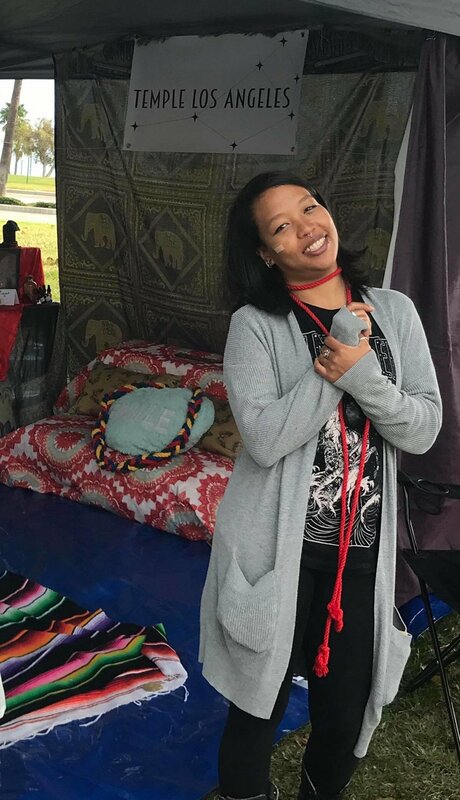 Mi-Ri is a student and team-member in our #WitchSocial, and assists with our tents and events. Quirky, strange, feisty, a little dark, calm and calming, specific, optimistic, the glammiest. All words to describe my vibe. A performer and storyteller for over two decades, I have a need to keep energy flowing and to bring life to the great party of the Universe we call this life. I believe in the healing power that each one of us possesses and that when we gather, those energies ignite. My focus is to bring forth path awareness and healing through love, energy and storytelling, opening you up to your unending spiritual potential and power. For more information on #Witchsocial check out our facebook page here. Sarah is the creator of magickal items here at Temple LA, and contributing writer. Her work is also featured on IG @ThirdEyeCapybara. Former community builder in property management, shifted into lover of wood, stone, plant, and found things, magick and witchcraft. Her work is respectfully centered on love, in power, in relationship with the trees, plants, animals and people she is with. Her current studies are in psychology and human sexuality, spirit connection, plant, animal, stone, and divine spirit workings. Sarah is a member of our book-studies, artist, and is well versed in the arts of creating ritual and magick! Sarah is a wonderful maker with a genius heart, centered on deep respect, an awesome irreverent humor, a strong focus on community, and an undying love of animals.